In 1910, FDR won a seat in the New York State Senate. It would be the only election in which he carried the Republican stronghold of Dutchess County where his Hyde Park home was located. As a freshman senator, he led a challenge to the Tammany bosses who sought to elect one of their own to the United States Senate (senators from New York were at that time elected by the state legislature). Although the uprising failed in the end, FDR won wide renown for his efforts. He introduced legislation to protect farmers that successfully passed and headed the Senate Forest, Fish and Game Committee where he began to emerge as a leader in conservation. In 1910, Roosevelt ran for the New York State Senate from the district around Hyde Park in Dutchess County, which had not elected a Democrat since 1884. He entered the Roosevelt name, with its associated wealth, prestige, and influence in the Hudson Valley, and the Democratic landslide that year carried him to the state capital of Albany, New York. Roosevelt entered the state house, January 1, 1911. He became a leader of a group of reformers who opposed Manhattan's Tammany Hall machine which dominated the state Democratic Party. Roosevelt soon became a popular figure among New York Democrats. He was reelected for a second term November 5, 1912, and resigned from the New York State Senate on March 17, 1913. 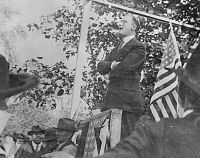 Roosevelt, a Democrat like his father, tried politics in 1910 and won a seat in the New York State Senate from his traditionally Republican home district. He flourished as a courageous and adroit political contender. State legislatures elected U.S. senators in those days. 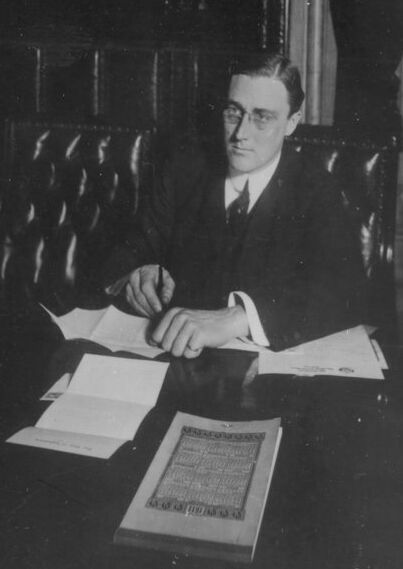 Leading a group of fellow Democratic legislators, Roosevelt spearheaded a successful drive against a candidate hand picked by the party bosses. His ploy infuriated Tammany Hall, the Democratic political machine in New York City. In 1912, Roosevelt was reelected to the State Senate. That year he actively backed Woodrow Wilson against his fifth cousin, Theodore Roosevelt, in the presidential election. Wilson won and rewarded the young senator with the post of Assistant Secretary of the Navy in 1913. Josephus Daniels, Secretary of the Navy, tutored his assistant on national politics, including the art of dealing with Congress. In 1914, Roosevelt sought nomination as a candidate for the U.S. Senate. He was trounced, mainly because Tammany Hall had opposed him.